There are a lot of things that merit outrage. 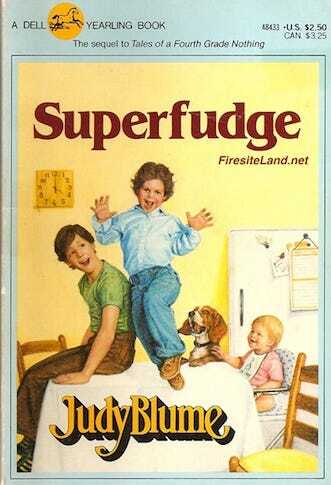 Judy Blume's 1980 kid's book, Superfudge, is not one of them. Or, so I thought. A few weeks ago, just in time for the holiday season, I discovered an angry mob of Amazon reviewers have flocked to the Superfudge page to warn of dangers of Chapter 10, entitled "Santa Who?" "Thanks for ruining Christmas, Judy Blume," reads one reviewer's headline. Another exclaims: "WARNING! Do NOT allow kids who love Santa read this book"
My personal favorite is this headline that reads like a triple spit-take. "Anti Children! No Santa!? Are you Crazy?! Awful"
What did Blume do to warrant so many interrobangs?! For Fudge newbies, Blume's book is about a little brother named Fudgie, a big brother named Peter, and the moral panic that comes with being a smart, sentient kid-sized person in a world where adults make all the decisions. Compared to Harry Potter, nothing really happens. But, then everything happens. In the chapter in question, Peter is concerned that his lil' bro is being misled by his parents. "I don't think it's a good idea for you to let him go on believing in Santa. He thinks you can get whatever you want just by asking," he tells his mom. Mom isn't nearly as concerned, but she admits that "sooner or later he'll have to learn that Santa is just an idea." Her bluntness is chilling, and so is her ignorance to Peter's baggage. How do you keep a devastating secret from a kid when you know he'll find out the truth eventually? Why would a bunch of grown-ups make up something wonderful only to take it away? And, when are you ever emotionally prepared to learn you've been lied to? This may explain why the book has caused so much Amazonian conflict, not so much for kids, but for their parents. Once you get past all the assault-like punctuation, the reviews are kind of heartbreaking. "As a parent of four kids under 8 years old, I can't help feeling somewhat betrayed by an author." "I was furious. What kind of children's author does that???" "I think my daughter's OK but I'm absolutely traumatized!!" And, then there's this one: "I was shocked and disappointed that the author plainly tells children there is no Santa Claus (she's wrong of course)." I guess Fudge's mom was wrong. You don't ever have to learn that Santa is just an idea if you don't want to.